After a kill off from LBV, anglers have reported catching fewer bass, in particular bigger fish. But indications are that an infected fishery will recover within a year or two. More largemouth bass are killed annually in the U. S. by other known diseases than by LBV. LBV is related to the virus found in frogs and other amphibians and is almost identical to a virus isolated in some fish imported to the U.S. for the aquarium trade. Most bass that carry the LBV will appear completely normal. In some cases the virus has triggered disease; dying fish will be near the surface and have trouble swimming and remaining upright. That’s because the virus attacks the swim bladder, causing bass to lose their ability to maintain buoyancy. Diseased fish might also appear bloated. Sores may appear on some fish but are caused by secondary infections of bacteria or fungi. 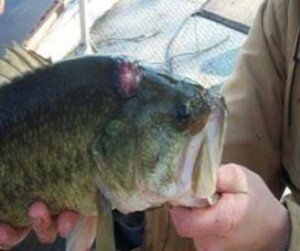 Any water habitat that has the largemouth bass is susceptible to this disease. Since 1995, it’s been found in 21 states: Alabama, Arizona, Arkansas, Connecticut, Florida, Georgia, Indiana, Kentucky, Louisiana, Michigan, Missouri, Mississippi, New Hampshire, North Carolina, Oklahoma, South Carolina, Tennessee, Texas, Vermont and Virginia. 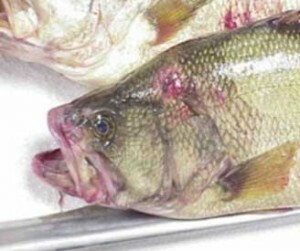 Scientists aren’t sure how LBV was introduced but they do know it can be carried by other fish species, to date; it has produced disease only in largemouth bass. Fish that come in close contact can easily infect one another (live wells can transmit the disease). Transmission through the water and eating infected prey are also ways that the disease is spread. There is currently no cure. Scientists don’t know enough yet about the virus to determine if it will have long-lasting effects on bass populations. Indications are that it will not harm fisheries long term.